A downside to downing dams? In the view of conservationists," author John McPhee once wrote, "there is something special about dams, something - as conservation problems go - that is disproportionately and metaphysically sinister." For many conservationists, there is also something special about tearing those dams down, something satisfyingly unambiguous about the very phrase "dam removal." If rivers, as McPhee speculated, symbolize life, and dams symbolize their humiliation, it's easy to see dam removal as a victorious restoration - even a glorification - of life itself. More than 200 U.S. dams have come down since 1999, and dozens are slated for removal. Most, if not all, are reaching the end of their life expectancy. Many are unsafe, inefficient, or simply no longer needed for their original purpose. Many have harmed fish or river ecosystems in ways not recognized at the time of their birth. Their decline and imminent fall means conservationists can, for once, simply sit back and celebrate. Right? Yes - and no. In the arid highlands of central Arizona, along a newly liberated spring-fed river known as Fossil Creek, a Northern Arizona University research team is watching what happens as a dam comes down. They're learning that it's much more complicated than one might expect. "Since some of these dams were built, there's been 100 years of sediment built up, 100 years of nutrients, and 100 years of new opportunities for invasive species to set up shop," says Emily Stanley, a dam-removal researcher at the University of Wisconsin. "So when you remove the dam, you're not necessarily going back to that lovely, pristine ecosystem you had before the dam." 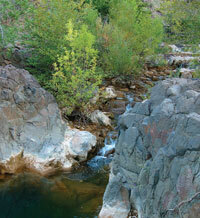 In the late 1800s, visitors to central Arizona described an oasis in the desert. Fossil Creek, a 14-mile long stream, was fed by springs rich in calcium carbonate, which formed a series of travertine barriers and striking blue-green pools along the river reaches. The creek "was constantly building great round basins for itself, and for a long distance flows over bowl after bowl," the naturalist Charles Lummis wrote in 1891. 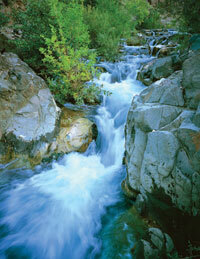 But as the city of Phoenix grew, it put Fossil Creek to work. The Childs-Irving hydroelectric project was built in the early 1900s; its diversion dam and two associated power plants, intended to serve both Phoenix and the mining town of Jerome, reduced most of Fossil Creek to little more than a trickle. The federal government granted the project a 50-year license in 1951. By the time its expiration date neared, newer projects had dwarfed its contribution to the region's power supply, and environmental groups began pushing the Federal Energy Regulatory Commission to decommission the dam. While environmentalists dreamed of a resurrected desert stream, scientists at Northern Arizona University in Flagstaff saw an unusual research opportunity. Beginning in the late 1990s, ecologist Jane Marks and her colleagues, funded by the National Science Foundation and other sources, formed a research team that included not only biologists, but also a hydrologist, a geologist, an engineer and a social scientist. Though Marks had never studied dam decommissioning firsthand, she knew from previous research that it usually had ecological costs as well as benefits. She also knew, as other researchers had discovered, that no two decommissionings were exactly alike. No one was certain how the return of full flows to Fossil Creek and the subsequent lowering of the dam would change the geology and ecology of the stream. Her team's challenge was to observe these changes, untangle their causes, and use that knowledge to help turn a demolition project into a genuine restoration. The federal government approved the decommissioning of the Childs-Irving project in 2004, ruling that the environmental benefits of river restoration outweighed the benefits of hydropower. The first step would be to shut off the flume that fed water to the hydropower plants, a move that would return full flows to Fossil Creek. Two or three years later, the utility would begin to lower the 25-foot-high dam. Wildlife managers knew that for native fish above the dam, the $13 million restoration project would be meaningless - even harmful - unless they controlled the swarm of non-native fish, such as bass and sunfish, that flourished below the dam. So a group of state and federal agencies poured $1 million into protecting the native fish of Fossil Creek. They built a barrier near the mouth of the creek, hoping to block the entry of new exotic fish. They netted as many native fish from the creek as they could, keeping more than 1,900 fish in storage tanks while they poisoned the exotic fish remaining in the water. They then brought the native fish back to the river via helicopter. While similar fish barriers exist throughout the country, the Fossil Creek structure is larger than most. No other dam-removal project had undertaken such an elaborate effort to protect native fish. But results were far from guaranteed. On June 18, 2005, after nearly a century of water diversion from Fossil Creek, Arizona Public Service shut off the flume that fed its power plants, allowing full flows to return to the creek. "Everyone was there, just waiting for the water to move downstream," remembers Marks. "There are a lot of places in a riverbed for water to go, so it came down slowly, filling all the nooks and crannies, all the pools and side channels." By the end of the day, the creek was filled, transformed from a trickle of 1 to 2 cubic feet per second to a robust flow of as much as 50 cubic feet per second. Just weeks after the return of full flows, the travertine formations in Fossil Creek responded. "You can practically stand on the shore and watch the bedrock form," says Marks. Northern Arizona University geologist Rod Parnell, who has studied travertine at Fossil Creek both before and after the decommissioning, says the travertine is not only spreading over a wider area, but also forming at a faster rate than before the return of full flows. "When geologists see extremely rapid responses, they're usually looking at floods or volcanic eruptions - things that don't have a whole lot of benefits," says Parnell. "It's been great to see such a positive response in such a short period of time." The native fish population also reacted dramatically: In reaches where flows had been restored and exotic fish removed, native fish increased by more than fifty-fold, rivaling the longstanding native fish population above the dam. (In a stretch where flows had been restored but exotic fish remained, the increase in native fish was comparatively meager.) Within six months, the invertebrate population bounced back from the effects of the poison used to eradicate the exotic fish, and the new travertine dams helped feed the invertebrates by trapping leaf litter. "In the short term, at least, this is a huge success," says Marks. "We couldn't ask for better results." But the real-world experiment is far from complete. The Fossil Creek dam, by pooling water upstream, has actually preserved a stretch of key habitat for the rare lowland leopard frog. Before the restoration began, biologists warned that simultaneously returning full flows and lowering the dam would radically alter this upstream habitat before the habitat downstream had a chance to recover. The utility heeded their advice, and postponed the lowering. Since the return of full flows, tadpoles and young frogs have reappeared below the dam. "It's crazy how much the habitat has changed," says Forest Service wildlife biologist Janie Agyagos, who has worked closely with the Northern Arizona University researchers on the Fossil Creek project. "Before, we had stagnant pools and very little running water. Now we have deep, deep pools that adult frogs like, and shallow pools with good cover for tadpoles and egg masses, and lots of aquatic vegetation." But because researchers are still awaiting the return of a healthy adult population, the utility has delayed the start of dam lowering for an additional year, until late 2008. When dam lowering does begin, the utility will remove only a small portion of the estimated 25,000 cubic yards of sediment behind the dam. The remainder will wash downstream, and Marks and her team will be watching closely. They don't expect the sediment to do any lasting damage to the ecosystem - it's comparable to what might come downstream in a "really big storm," says Marks - but it may smother some macroinvertebrate and leopard frog habitat. Another uncertainty lurks within the beautiful travertine formations in Fossil Creek, which provide a perfect home for crayfish - a voracious species, exotic to Arizona, that Rod Parnell calls "the aquatic equivalent of the cockroach." Crayfish survived the poisoning of the creek - likely because they could burrow into the riverbed or crawl out of the water - and have multiplied since flows returned. Researchers suspect that, ironically, exotic bass helped keep the crayfish at bay. But here again, the story is not yet finished: The travertine now forms with such gusto that it even grows on crayfish shells, threatening to turn the crayfish into miniature statues. Despite conservationists' fervent hopes, dam removal alone is no panacea. On the Sandy River in Oregon, the Marmot Dam has separated populations of wild fish from hatchery fish. Dam removal will allow hatchery fish to move into wild fish habitat. Likewise, the oft-discussed removal of the two Elwha River dams in Washington state - recently postponed again, this time until approximately 2012 - could allow an invasive species of brook trout to move into Olympic National Park, where it would compete with native bull trout. Science is beginning to inform how and when dams come out, and, at Fossil Creek and elsewhere, it is helping to anticipate and minimize some of the downsides of dam removal. But the field is a young one - "There's still a lot more talk about dam removal than there is study of dam removal," says University of North Carolina researcher Martin Doyle - and frequent delays in dam deconstruction continue to make new knowledge difficult to acquire. The result is that while dam removal is a powerful restoration tool, it remains an uncertain business, and that uncertainty has both ecological and political consequences. "Everyone knows what a pristine ecosystem looks like, so it's easy for them to embrace it and say, 'We're going to protect this,'" says Andrew Fahlund of American Rivers, who worked on the campaign to decommission the Childs-Irving project. "With restoration, you're asking people to trust that the picture you've painted for them is the picture they're going to get. That's a big leap of faith for the general public, and for the decision-makers who are going to be held accountable." But in dam removal, as in so many other conservation efforts, the unknowns are enduring, and leaps of faith are unavoidable. The author is a contributing editor of HCN. This article was made possible with support from the William C. Kenney Watershed Protection Foundation and the Jay Kenney Foundation.